A friend asked me to create a bedside lamp for an artist-in-residency residence. No restrictions were made beyond it having to function as a real table lamp and fit on a small table or wall at bedside. His attraction to art with a little funkiness and steampunk-like sensibility also guided me. This focused me on a certain spectrum of junk within my existing palate of discarded treasure. With that as a taking off point, I surrendered to the muse, playing with stream-of-consciousness, free-association architecture and construction. 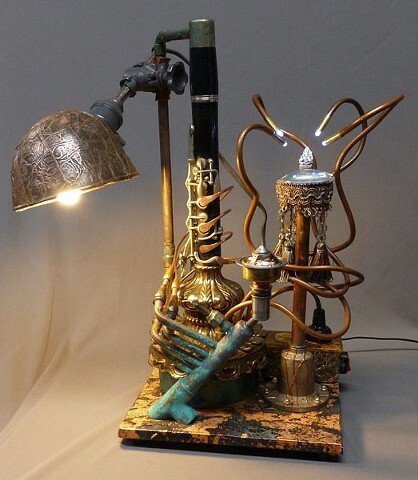 Some thoughts during the creation of Tubular Lighting Solution: I had the upper body of a clarinet that had been haunting me for a couple of years and my expansive collection of brass and copper scraps. The idea of copper "fingers" on the clarinet was attractive. A long-anticipated experiment with teflon-coated wire inside bent copper tubing as a lighting source for tube-mounted LEDs was successful. A small pedestal became a point of focus which I populated with a brass figure of Ga&#7751;e&#347;a, a deity of the Hindu pantheon. Among many other aspects, he is the patron of arts and sciences. A surprisingly deep chisel stab to the left index finger stopped tube bending for over a week. More so than in most of my projects, several ideas were fully realized, then abandoned.